While Samsung billed the Galaxy Note 9 as one of the world’s first “terabyte ready” phones, the S Pen-wielding powerhouse still needed a (rather costly) microSD card to cross the 512GB internal storage barrier. 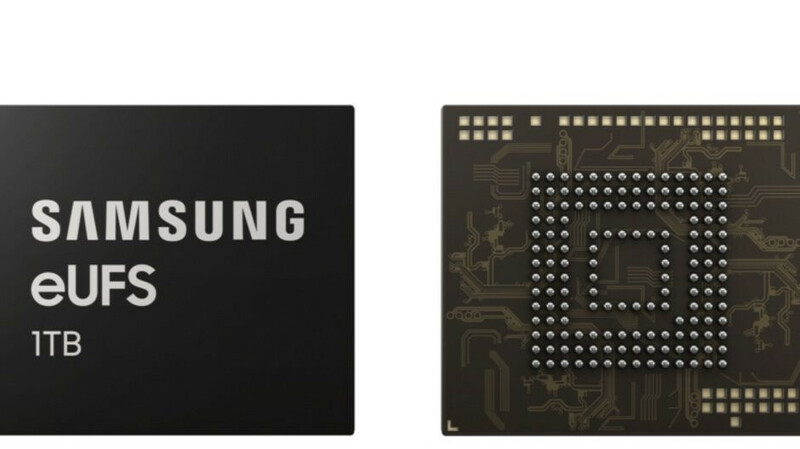 Unsurprisingly, Samsung, which just so happens to be the world’s largest chipmaker in addition to the number one smartphone vendor out there, is announcing the start of mass production for the “industry’s first” one-terabyte embedded Universal Flash Storage (eUFS) 2.1 solution. While the vast majority of today’s smartphone users can probably handle their mobile data-saving needs with as little as 64 or even 32 gigs of storage, Samsung believes the ability to pack a grand total of 260 10-minute videos in 4K UHD (3840 x 2160) format will come in handy for certain people. Of course, the main point of these types of developments is not always to provide a solution to existing problems or needs. Instead, Samsung is no doubt looking towards the future with the world’s first 1TB smartphone storage chip, as mobile devices continue to make great strides as far as content production and consumption are concerned. It’s wise to be prepared for further advancements in fields like augmented reality and virtual reality as well, which may soon require storage capacity beyond what’s currently viewed as necessary in the high-end smartphone arena. Then there’s the speed aspect, which Samsung has been continuously improving since launching the aforementioned first UFS solution. The 1TB eUFS package is not physically larger than its 512GB predecessor, but it does manage to be significantly faster, supporting sequential read and write speeds of 1000 MB/s and 260 MB/s respectively. That’s up from 350 MB/s and 150 MB/s just a few years back, which means you’ll soon be able to transfer large amounts of multimedia content at unprecedented velocity. Galaxy S10 or Note 10? Even though rumors of a mind-boggling Galaxy S10 configuration with incredible amounts of memory and storage in tow have been around for several months, we’re here to temper your excitement and expectations. We truly hate to burst your bubble, but it’s highly unlikely that Samsung will make it to market in March or April with a component that’s barely kicked off mass manufacturing. Let’s say there’s an outside chance the 5G-enabled Galaxy S10 variant or the company’s first commercial foldable device will get 1TB internal storage in limited numbers, but we wouldn't hold our breath. This is obviously just a guess, although history can be a very reliable indicator of these things. Case in point, the aforementioned “terabyte ready” Galaxy Note 9, which was released a full nine months after Samsung’s 512GB UFS production start announcement. Bottom line, you have one more reason to be excited about the Galaxy Note 10. In short, a lot. In long, a whole lot. After all, the Galaxy Note 9 starts at a fairly extravagant $999 with a “modest” 128 gigs of local digital hoarding room, which goes all the way up to $1,250 in a 512GB configuration. Assuming the same premium will apply, it’s reasonable to expect a 1TB Galaxy Note 10 officially priced at a whopping $1,500 or so. Then again, the Note 9 is slightly more expensive than the Note 8 back at launch, so it’s possible the Note 10 will be even costlier. You also have to consider the gap between 512GB and 1TB is much larger than the 128 to 512 gigs difference, so judging strictly from a per-gig standpoint, Samsung may need to go quite a bit higher than $1,500 to maintain its profit margins. On the bright side, flash storage parts have become cheaper to produce in recent years, so at least in theory, Samsung could keep the price of the 1 terabyte Galaxy Note 10 around the “reasonable” $1,500 level. 10 minutes 4k video recording is innovative in 2007! "We truly hate to burst your bubble, but it’s highly unlikely that Samsung will make it to market in March or April with a component that’s barely kicked off mass manufacturing. Let’s say there’s an outside chance the 5G-enabled Galaxy S10 variant or the company’s first commercial foldable device will get 1TB internal storage in limited numbers, but we wouldn't hold our breath." But according to GSMarena: "Samsung Electronics announced the industry's first 1TB eUFS 2.1 (embedded Universal Flash Storage). The chip has already entered mass production so we can expect the next-generation premium smartphones to feature it and the Galaxy S10+ will likely to be the first one"
Its all just predictions. Obviously. phone sites writers are not leakers... They have educated prediction. In my educated prediction i agree with phone arena. Be careful Samsung, and pay close attention to what’s happening to the iPhone right now. Even though you’ll get way way more in a $1500 Note vs a $1500 iPhone, people are clearly demonstrating with their wallets, that they don’t wanna pay that much. Wallets are speaking (Samsung). Very sad that Samsung is still pushing UFS 2.x after one year of UFS 3.0 specs being introduced. So? This one is still the FASTEST UFS storage you can get right now, Samsung's UFS storage getting faster each year, and it still under UFS2.1 theoritical max speed right now, they could release another UFS 2.1 next year push it to 1200MB/s sq read speed before jumping to UFS 3. Specs standard introduction is just the precursor for the upcoming development to follow that standard. Just like DDR5 SDRAM specs released by JEDEC on 2016, and expected to be available for end user in 2020. My 32GB S7 is still have a lot of free storage. I don't know if I have a device with 1TB storage what should I do to maximise my terabyte storage? A lot of UHD movie? Or something else? That might be technically true, but outside of the Asian Market, Smartisan is relatively unknown to the World. Globally, Samsung is Very Well Know for it's Cellphones as well as other products. Also, where did Smartisan obtain the 1TB Chip inside their Phone? Who made it?